Barcelona has the largest cruise ship port in the Mediterranean basin, with seven terminals. It also has nine passenger terminals and four ferry terminals. It links to the Balearic Islands and the main Mediterranean ports. Along the city's coastline are also four marinas with everything you need for mooring private boats. Barcelona is Europe's leading port for cruise ships. There are 7 international passenger terminals and all have excellent links with the city's old quarter, a stone's throw from the Rambla. Ships cross the Mediterranean from here and lots of transatlantic liners call at the city. 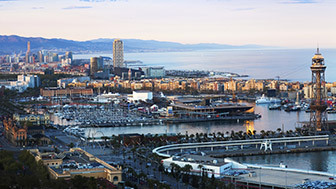 The port of Barcelona has three terminals dedicated to ferry traffic and short sea shipping, and they all have good connections with the city's public transport network. Ferries leave daily for the Balearic Islands, and there are also direct links with various ports on the Italian coast and Tangiers. Barcelona is intimately bound up with the sea. That explains why there are a total of 14 marinas along the province's coastline. In the city alone there are four and they are the best option for anyone wishing to arrive in Barcelona by private boat. 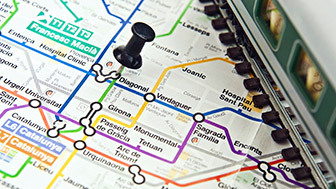 Explore the map at a click for Barcelona at its most iconic. The city has a wide and diverse range of accommodation for every budget.